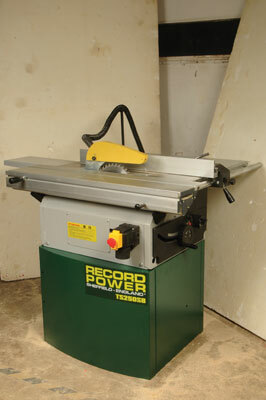 Record were keen on getting their newest tablesaw in the pages of WPP and sent in their TS250SB to see if it cuts the mustard. The first job was assembly. It was quite easy, though it is definitely a two-man job, particularly lifting the main body of the saw onto its stand. There were one or two problems in getting the thing up and running: a locating hole for the saw's sliding table had to be redrilled as it was slightly misaligned. Also, a locating plate for the slide had to be removed, as it prevented the table from lying flat. But with a little bit of jiggery-pokery, the machine was assembled fairly quickly. For a low-end machine, it has to be said that it works very well indeed, and has a few features to make allegedly higher spec machines blush. For a start, the ripping fence has a microadjuster, which works very well. The main fence slides easily and has an accurately placed rule to give correct fence position. the blade angle knob. This unlocks with a butterfly handle, which operates the tilt arbor with a rack and pinion mechanism. The table comes with a mitre fence which locks into position on the sliding table, and also brackets which are affixed in the same place for holding waney edged boards for dimensioning. You can also buy a full dimensioning set-up. 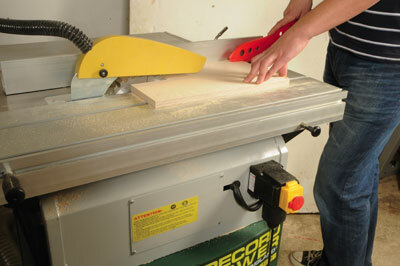 The table needs to be used with the proper extraction and there are two extraction ports. Once fired up, the machine runs quietly and smoothly. When ripping, the blade cuts true with the minimum of breakout. All in all, it is a joy to use, with all the controls being intuitive, and in the right place. There really is nothing to fault. Overall, this is a handsome bit of kit for the price. It puts many more expensive tables to shame. If you accept that our little bit of assembly trouble is just about acceptable, for the money you can't go wrong with this machine.